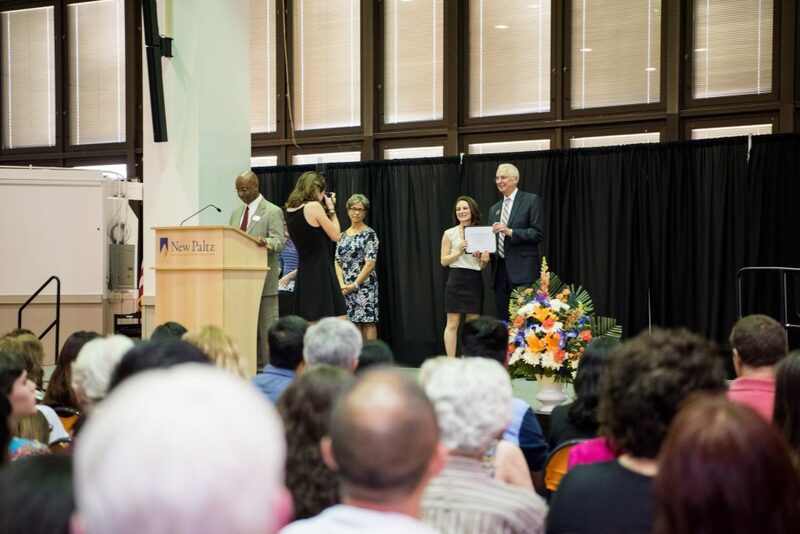 It is a SUNY New Paltz tradition at the close of each semester to honor the efforts of distinguished graduates-to-be who have earned places atop their academic programs through excellent work in and out of the classroom. The spring 2017 Outstanding Graduate Ceremony, held on May 19, brought family, friends and faculty together to recognize the dedication of a select group of undergraduate and graduate students who made exemplary contributions to the College’s living and learning community during their time at New Paltz. “We’re here today to celebrate all the ways that you, our outstanding seniors, have succeeded in the classroom, laboratory, performance hall, studio, athletics field, the campus and local community, and study abroad programs throughout the world,” said President Donald P. Christian. Students representing all five of New Paltz’s schools – the School of Business, School of Education, School of Fine and Performing Arts, College of Liberal Arts and Sciences and the School of Science and Engineering – as well as the Honors Program, were named Outstanding Graduates this semester. They were selected by a faculty nomination process that alludes to the instrumental role New Paltz instructors play in accommodating students’ intellectual ambitions and helping channel their ardent creativity.